State of the Art Agriculture solutions that enable our customers to be the most efficient farmers in the world. The navigation tabs to the right will guide you through the different harvesting solutions we offer. The Top Air Topper Loader Series of harvesters is currently state of the art in the onion industry. This “One Step” method is considered by many in the industry to be the best and most efficient way to harvest onions. University studies have shown improved storage quality as a result of letting the onions dry naturally and handling them only once. Extremely high capacity, coupled with very gentle handling make these harvesters the perfect machine for the larger Spanish type onions, as well as the smaller, harder European varieties. Our patented Top Air topping system utilizes air and a sickle knife to efficiently sever the tops from the onions. The onion tops, along with other light debris are then ejected out the rear of the machine with relatively clean product continuing through the harvester. The onions then travel upward in our unique Top Air vertical elevator. Our exclusively designed inspection table then allows manual sorting to remove heavy debris such as stones, dirt clods and cull onions, resulting in very clean product going to the storage or packing facility. Topper Loaders are custom manufactured to fit any bed configuration. The Top Air Topper Windrower Series of harvesters continues to be a mainstay in the onion industry. The first step of the “Two Step” method of harvest, Topper Windrowers are very popular in areas where growers prefer to cure the onions in windrows after the tops are removed. Extremely high capacity, coupled with very gentle handling make these machines capable of harvesting any type of onion. 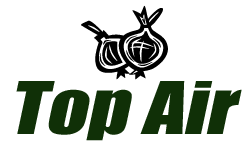 Our patented Top Air topping system utilizes air and a sickle knife to efficiently sever the tops from the onions. The onion tops, along with other light debris are then ejected out the rear of the machine. The lowering conveyor system then gently transfers the clean onions to the ground into windrows. After curing, the windrows can be picked up by any one of our Top Air high capacity loaders in the second step of the “Two Step” method. 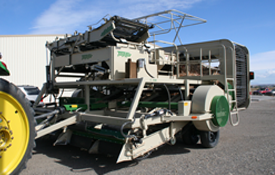 Topper Windrowers are custom manufactured to match any bed width and windrow configuration. The Top Air Onion Rod Lifter Series utilizes the counter rotating square rod concept to undercut onions. The slightly inclined tandem rod design allows the first rod to make the initial cut, with the second rod loosening the soil from the roots for faster curing of the onions. After undercutting, the onions maintain their upright position to help avoid sunburn. The hydraulic drive replaces drivelines and gearboxes for extremely low maintenance. Guage wheels maintain precise depth for a close, consistent cut. Onion savers can be utilized to prevent onions from falling into corrugations or wheel tracks. Rod Lifters are custom manufactured to match any bed configuration. The Top Air Onion Digger Series of harvesters has become a popular solution to undercutting onions in the southern United States. As this area is subject to frequent rains during the harvest season, the onions are best undercut and placed on top of a firm bed. Top Air diggers accomplish this by first undercutting with a blade. Then, conveying the onions up a belted chain bed to remove soil from the roots, which allows for better curing. Then, firming the soil with a roller, which allows rain water to run off the bed. The onions are then laid back on to a firm bed. This method allows the soil free roots and tops to dry in these difficult climatic conditions.